ALLEGED BRUTAL MURDER AT HEDDON-ON-THE-WALL. On Saturday, a brutal case of kicking, which subsequently resulted in the death of man named Thomas Stobbart, occurred at Heddon-on-the-Wall. Two miners, Ambrose Graham (21), and William Graham (26), brothers, living in the same village, are in custody charged with the wilful murder of Stobbart. It appears that the Grahams, along with Stobbart, who is a quarryman, a man named Harrison, and another man named Park, belonging to Wallsend, were drinking together at Armatage's public housee, at Heddon-on-the-Wall, on Saturday night. The hour for closing being near, they left the public house to go home. They appeared to be friendly at that time, but after going about hundred yards along the road Harrison and William Graham quarrelled and commenced to fight The quarrel arose about some dogs owned by the men, and whilst the fight was going on Ambrose Graham is stated to have interfered and struck Harrison. It is alleged that the Grahams then knocked Harrison down and kicked him. Stobbart interfered, and said "Don't kill lad," or something to that effect. Immediately on uttering the words Stobbart was struck, and a general fight ensued. It is alleged that during the fight Stobbart was knocked down by the Grahams and severely kicked, especially about the head. Harrison and Park ran off followed by the Grahams who left Stobbart lying insensible on the ground. He was afterwards found by a man named Hobson, who had him conveyed to his house in the village. He was put to bed, and during the morning he spoke, complaining of his head. Apprehending danger, his wife at once aroused some neighbours, and on further examination it was apparent that Stobbart had received serious injuries. A medical gentleman was sent for, but on the arrival of Dr. Atkinson of Wylam, Stobbart was dead, having expired at half-past four o'clock in the morning. On Saturday night about 11 o'clock, Police-Constable Scott, stationed at Heddon-on-the-Wall, received Information that the Grahams were kicking the deceased in a brutal manner. He went to the place named by the informant, but saw no one, and everything appeared to be quiet. About four o'clock in the morning he received information that Stobbart was dying. He went to the house, and on arriving found him at the point of death. Seeing that he had been badly used the officer made inquiries, which ultimately led to the apprehension of the Grahams. The prisoners were afterwards with assistance taken the lock at the Moot Hall, Newcastle. They were brought up before Mr John Burnett, charged with the wilfull murder of Stobbart, and after sufficient evidence had been given by the otficer Scott they were remanded. On Tuesday, the remains of Thomas Stobbart, who, it is alleged, was kicked to death by two men named William and Ambrose Graham, were interred in the cemetery at Heddon tbe-WalL A number of the villagers and friends of the deceased attended the funeral. Stobbart is described as a sober and industrious man, and great sorrow is expressed for the deceased's wife, who is left with three children. Some additional particulars have been made known. The Grahams, it is stated, separately ill-used the deceased, who interfered on behalf of two young men with whom the Grahams quarrelled. Jane Stobbart said: I am widow of the deceased, Thomas Stobbart. I identify the body as that of Thomas Stobbart. He resided at the Blue Row, Heddon-on-the-Wall, and was a quarryman. He was 30 years of age. He died on the 1st of October, between four and five o' clock in the morning. He left my home about six o'clock on Saturday evening, in company with Harrison. I saw him again a little after ten o'clock. He was brought home by three men - Thomas Robson, Robert Birtley, and another man whom I do not know. I was in the back kitchen at the time, and I had no conversation with my husband. He said nothing at the time. Thomas Robson called for water, but I don't think my husband drank any. I got him undressed and put to bed. His watch dropped down whilst he was being put to bed, and be made a sign with his hand to pick it up. After he was in bed I expected him to fall asleep. During the night he vomited twice. After vomiting he said, "My head is bad." I put a handkerchief round his head, and after that Icexpected he dropped asleep. I dropped to sleep also; but I was awakened by a rattle in his throat between three and four o'clock. He died at half-past four. Joseph Harrison said: I live at Walbottle, and lodge at Mrs Robson's. l am a quarryman. I was in Armatage's public house about seven o'clock on Saturday night. I saw the deceased there. I also saw Ambrose Graham, William Graham, Thomas Robson, Frederick Park, and John Aitchison there. Other men were in the house, and amongst them was man named Joseph Malthouse. I left at ten o'clock with Stobbart, Frederick Park, John Aitchison, Malthouse. and William Graham. I can not say where Ambrose Graham was at that time. We went on to the top of the bank at the back side of the pond. William Graham and I got talking about a dog, and Graham said that I could have the dog any time I liked. Some one mentioned the mother of the dog, and said she was a good one. I said there were several as good as her; she was well named—Luck's All. William Graham said I could not find one as good as her. I said I would match one to run her, and he said I couldn't. I put my hand out, and said I can match her now. When I fetched my hand back he said I had struck him on the face. I said I had not, and he said I had. He seemed to get vexed, and I said. "It is no use you trying to frighten me; I won't let you frighten me.'' Ambrose Graham then shouted, ''Let me at him; I can pay him. wrestler as he is.'' When Ambrose shouted William shoved his fingers into my neck, and got hold of my necktie and shirt. Ambrose Graham then rushed me, and struck me on the brow. William Graham, Ambrose Graham, and I then closed. We all went together; William Graham was lowest Ambrose Graham, who was on the top of me, commenced striking me. There seemed to be more striking me, and I hid my face on William Graham. We rolled over two or three times, and then I got up. When I got up, I was knocked down again from behind. I don't know who knocked me down. I was up and down about three times. I heard Stobbart say, "Don't kill the lad," or "Don't hurt him; " I don t know which were the words. I was down at the time he said that. He said it to the men who were striking me. William Graham was one, but cannot say who the others were. When Stobbart shouted, they seemed to leave me. When I got up I saw Thomas Stobbart and Ambrose Graham struggling together. I saw Thomas Robson run to them. Stobbart had Ambrose Graham at arm's length, apparently keeping him back, and Robson broke in on them. Robson seemed to break Stobbart's guard. I got four or five yards away from them, and on turning I saw a third party run in to Stobbart, Robson and Ambrose Graham. I saw Stobbart swing round and flung on to the ground. Ambrose Graham was one and Thomas Jobey Robson was the other man. I can not say who was the third. Stobbart fell on to his knees and belly. Ambrose Graham had him by the hair of the head, and was standing crossed-legged over him—a leg each side of the body. He had his head lifted about a foot from the ground with his left hand, and was striking him with his right He was making his right leg go against his body, apparently about the chest. The other two men left Stobbart and Ambrose Graham. A third party came and I ran and shoved and struck him. I could not make him out. When I did that William Graham and Thomas Robson ran at me, and also the man I struck at. Frederick Park, my companion, then ran away, and shouted "Joe, come on, they will be at you again." I ran after him. William Graham and Thomas Robson followed us. I did not see Stobbart or Graham or Robson after that. Graham and Robson followed me about 150 yards. The night was not very dark. Stobbart was lying on the ground when I ran away. Thomas Jobey, alias Thomas Robson, said: I live at Heddon-on-the-Wall and am a miner. I was at the Three Tuns public-house on Saturday night and left at closing time. I left with the deceased, Harrison, Wm. Graham, and Park, and another man. We went up the bank, and they argued about dogs and wanted to match them. Harrison and Wm. Graham were going to put money into the deceased's hand. Harrison got hold of Wm. Graham's whiskers. Ambrose Graham said ''We'll have none of that" Harrison then sparred himself to Wm. Graham and they started to fight. I think Harrison flung Graham. Ambrose got them parted. I got hold of William and kept hold of him until a dog came and bit my leg, when I left hold of Wm. Graham. Graham ran away to Harrison again. Ambrose and deceased, and either Johnson or Park commenced fighting. They kept fighting down to a cart, and I saw the deceased fall. I thought he fell against the cart wheel, but I was not sure. I think he fell backwards. No one got hold of him that I saw when he was on the ground. I then went a little bit along the road, and I pulled Harrison off William Graham. William Graham's wife was lying on the ground, and she was trying to get William Graham up. After Harrison jumped up he wheeled me round about, and then ran away. Park was shouting "Police," "Murder," at the same time. When Park was shouting Stobbart was lying further along. I cannot tell where Ambrose Graham was at that time. William Graham ran after the men that ran away. I went down to the hemmel end, and Stobbart followed me down. William Graham then came running up again, and said, Here's Stobbart now." I think he said, "Now, Stobbart, do you want a fight." William Graham and deceased then both set themselves to fight They went down together, and Graham jumped up and said to deceased, "Get up." I then lifted deceased up. Ha was insensible, and could not speak. William Graham then went up home. After I picked deceased up, Robert Birtley came up, and a man named Thomas Patten. We got deceased on to Patten's back, and carried him along home. When I got him home I got him a drink of water. He took a drink or two, I think. I got some water and gave him a bit of a "dabble," and after that started to wash himself. I said to him. " You have a black eye, Tommy," and he said, " A black eye is nought" I wanted to put his clothes off. His wife said she would manage. I think I said to deceased, "We wont get to Stamfordham in the morning." He talked to nobody else but me. Birtley and Patten could hear what was said if they had their ears open. By the Foreman: Ambrose Graham hit the deceased, and they both fell down. Ambrose Graham commenced fighting with Stobbart I did not see Ambrose Graham standing over Stobbart or have hold of the hair of his head. I did not see Ambrose Graham lift him up again; he might, I can't tell Two fights, namely, between Harrison and Wm. Graham and Ambrose Graham and the deceased, were going on at the same time. Dr John Ismay Atkinson described the result of the post-mortem examination, and said there was nothing to account for death, so far as regarded his Internal organs, and he had the appearance of being a healthy subject and strong. I don't believe that blows on the head with a fist would cause the the fractures. The fracture was too extensive to have been caused by an ordinary fall. It would take a decided blow with a hammer or some blunt weapon to cause such a fracture. A kick would cause such a fracture. The cause of death was produced by the clot of blood on the brain, which went down to the base the brain and paralysed the nerves and muscles. Police-Constable Malcolm Fleming Scott said: I a member of the Northumberland constabulary stationed at Heddon-on-the-Wall. On Saturday night last, the 30th of September, I was on duty on the highway leading from Frenchman's Row to Heddon-on-the-Wall. A few minutes before eleven o'clock I met Joseph Harrison. Fred. Park, and George Aitchison. Joseph Harrison said he had been badly used by the two Grahams—Ambrose and William. His hat was off, and his shirt neck was loose. He said he would meet him at ten o'clock on Sunday morning. He would have his hat and would summons them for assault. He said he had left the two Grahams using the deceased very badly. I ascertained the place from Harrison. I went and examined the place, and found marks the ground, as if there had been a struggle. I took particular notice of the cart that was standing saw no one. Everything was very quiet On Sunday morning, a few minutes before five o clock, I received further information from the deceased's sister. She said her brother was dying, and I went and saw him. From his appearance I thought was on the point of death. I ascertained that they had sent for a doctor. I then went to Throckley for the assistance of another constable, and returned with P.C. Richardson. I found Stobbart was dead. I then apprehended Ambrose Graham and Wm. Graham. I then charged them both with causing the death of Thomas Stobbart on the 30th of September. The reply was that it was a bad job that the man was dead. They both made that reply. After the inquiry had lasted seven hours, the Coroner summed up. The jury retired. After an absence of half an hour they returned into Court. The Foreman, who said the jury were unanimous in their verdict, handed the Coroner a slip of paper containing the precise terms of the verdict arrived at. Mr Green read the verdict as follows:— "We find that Thomas Stobbart came by his death from kicks and blows, and that William and Ambrose Graham are guilty of wilfull murder by killing the said Thomas Stobbart." The inquiry then terminated. 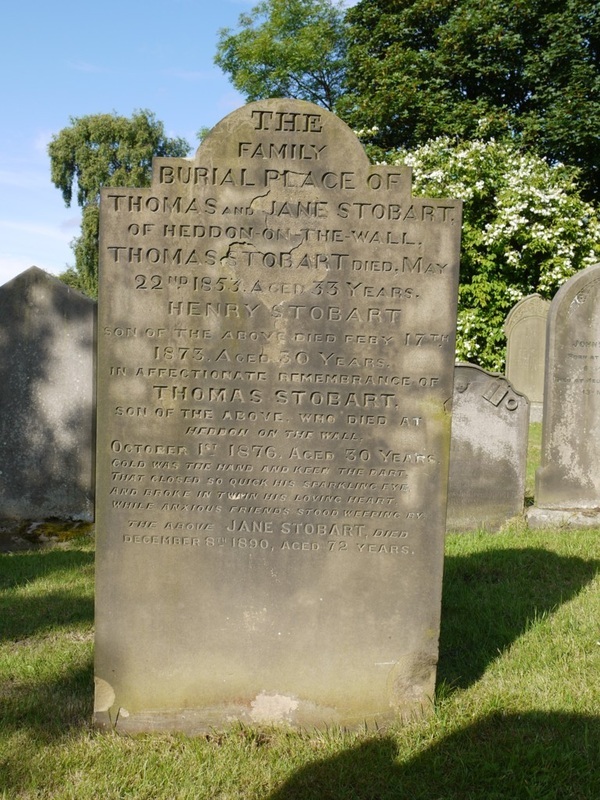 Gravestone of Thomas Stobbart (Stobart) and family, St Andrews Church, Heddon on the Wall. Photo A Curtis (2011). The family burial place of Thomas and Jane Stobart of Heddon on the Wall. Thomas Stobart died May 22nd 1853 aged 33 years. Henry Stobart son of the above died Feby 17th 1873, aged 30 years. In affectionate remembrance of Thomas Stobart son of the above who died at Heddon on the Wall October 1st 1876, aged 30 years. "Cold was the hand and keen the dart, That closed so quick his sparkling eye, And broke in twain his loving heart, While anxious friends stood weeping by." The above Jane Stobart died December 8th 1890 aged 72 years. The accused men were bailed and attended trial at the Northumberland Spring Assizes, Newcastle Crown Court, before Mr Justice Lopes as reported in the Newcastle Courant on Friday 23rd February 1877. Mr Blackwell agreed to prosecute simply on the charge of manslaughter; Mr Greenhow defended Ambrose Graham, and Mr Skidmore, William Graham. John Harrison was cross examined by Mr Greenhow: He had known the Grahams for seven or eight years. They were all on friendly terms that night. As far as he knew, the Grahams had borne good characters. He simply put his hand out to make a match. He was a wrestler. Stobbart's head did not strike the cart. Mr Greenhow submitted there was no case to go to the jury so far as Ambrose Graham was concerned. Mr Skidmore contended there was no case against either of the prisoners upon the evidence. His Lordship was of opinion that the case ought to be proceeded with. Mr Blackwell and the defending counsel having addressed the jury, witnesses were called and examined as to the characters of the prisoners. His Lordship summed up, and after an absence of about 20 minutes they returned into court. The prisoners were found not guilty and acquitted. Five years later, the 1881 Census records William Graham, coal miner, born Ovingham 1851 (age 30) married to Jane Graham (born Haydon Bridge, 1852) with four young sons: Ambrose (7), John (4), William (1) & George (0). He died in 1895 at Blayney Row (aged 45) and is on gravestone . William's oldest son appears to have been named after his brother, Ambrose, who can also be found on the 1881 Census. Ambrose Graham, coal miner, born Heddon 1856 (aged 25). He was one of two coal miners lodging with a Margaret Stobart (or Stobert), widow (born Simonburn, 1822), her two daughters: Margaret (25), Elizabeth (22) and grandson, John (born Heddon 1881). I do not know if this family was related. In 1881, Jane Stobart, widow, born Elgin 1845 (aged 36) was still living with her children: Jane (13), Henry (8) and Thomas (6).